With businesses looking to steal a march on their competitors in a booming manufacturing sector, the technology they rely on to do so must evolve and deliver perfect results on time, every time. As the supplier of best-in-class optical, non-contact, turned-part measurement machines and quality control systems across the UK and Ireland, VICIVISION UK understands this scenario implicitly. Its customer-oriented approach means it is constantly seeking to develop products in a way that exceeds even the highest expectations, providing reliability in a world where components are ever smaller, tolerances are increasingly tighter and demand for quality is at an all-time high. That’s why, across its M Series, Techno Series and X Series ranges, VICIVISION has unveiled new models and functionalities sure to appeal to and have significant benefits for manufacturers of all sizes. Its optical measuring systems cater for turned, ground and cylindrical parts. From the X Series for the micromechanics typical in dental and biomedical implants, to the wide working area of the Techno models to cater for specific applications like camshafts, pistons and electrical spindles, your need will be covered. By using superior high-resolution video camera technology to carry out a number of checks on a single set-up, there is no need for multiple specific instruments such as co-ordinate measuring machines or handheld gauges. Even the most complex parts can be inspected in a matter of seconds, down to the last minute detail. For static measurements that means diameters, lengths, angles, radii and orthogonalities; for thread measurements pitches, nominal diameters, core diameters, crest angles, helix angles and LG dimensions; and for form measurements roundness, axial and radial run out, coaxialities, cylindricities, dynamic parallelisms, nut measurements, rotation diameters, planes parallelisms and angular timings. Alongside advanced hardware and intuitive software that’s now easier and faster to utilise than ever before, users can expect detailed measurement reports to certify quality, barcode readers for automatic part programme loading and improved connections suitable for a wide range of fixing tools. At the touch of a button and with no operator intervention or human error, the fast, non-contact, non-destructive measurement on an all-in-one system can be achieved with VICIVISION. The capture of intricate features offers unerring accuracy in data collection – essential across industries like aerospace, automotive and medical, where the form, function and safety of critical components is non-negotiable. 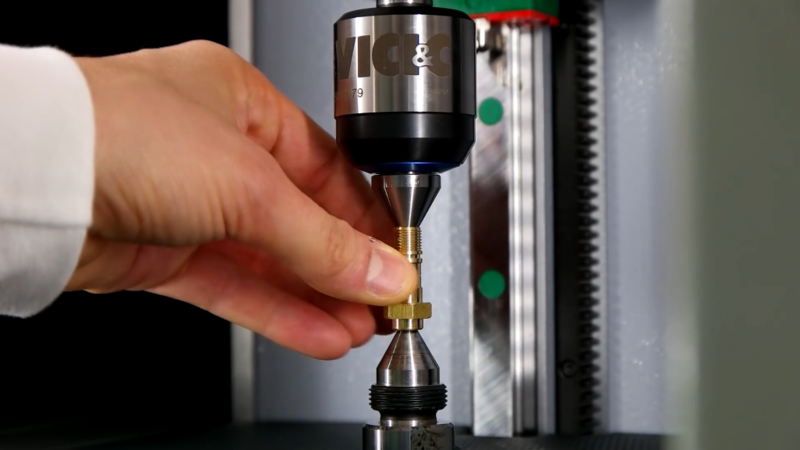 Designed specifically for use on the shop floor, VICIVISION turned-part measurement systems eliminate bottlenecks and reduce downtime as there is no need to leave the production environment. Minimal transportation of parts, increased flexibility, slashed rejection rates and less rework means an impressive return on investment. By investing in efficient, micron-precise and ultra-reliable measuring processes, manufacturers can guarantee an increased throughput of quality products, freeing up capacity and facilitating business growth. Have you heard about our flexible range of finance options?